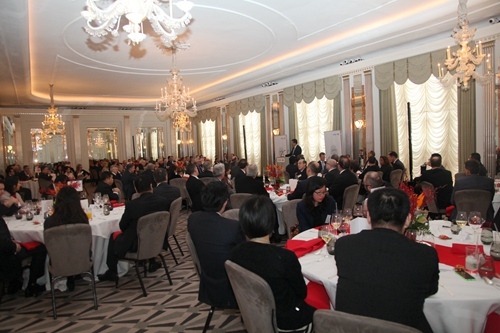 It is such a pleasure to attend the HSBC Chinese New Year Luncheon for the fifth consecutive year! Yet the same annual event never fails to offer a refreshing experience and to surprise with brand new discoveries. As we see the Year of the Horse out, we must give it a thumbs-up. It is a year of pride for the economic, trade and financial communities of both China and the UK. Two-way trade in goods grew by 15.3% to over 80 billion US dollars. Chinese investment in the UK exceeded 7 billion US dollars last year, pushing the total investment stock to over 40 billion. This has made the UK China's number one investment destination in Europe. Direct trade between renminbi and pound sterling was achieved. The China Construction Bank (London) became the first clearing bank for renminbi outside Asia. The Industrial and Commercial Bank of China and the China Construction Bank were both given the license to operate bank branch in London. The UK government successfully issued 3 billion yuan sovereign bonds. None of these would have been achieved without the joint efforts of the industrial, commercial and financial communities of both countries. That includes the all-out support from HSBC Group. 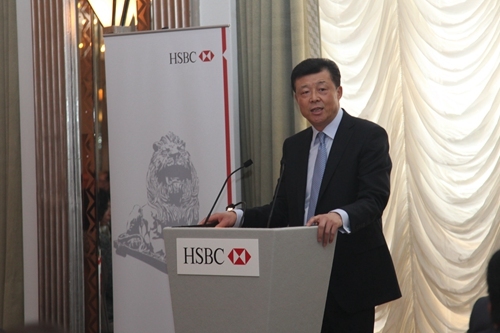 Last year also witnessed strong growth of HSBC's business in China. With 32 branches and 141 subbranches, you have the broadest network and coverage of all foreign banks in China. HSBC also won a string of awards in 2014, including "Best Foreign Commercial Bank in China", "Best Foreign Retail Bank in China", "Best Cash Management Bank in China" and "Best Provider of Offshore Renminbi Products and Services". I applaud you for such impressive achievements! I also want to thank the HSBC Group for your continued and wholehearted support for education, envrionmental protection and charity in China. Your donation last year of 7 million US dollars in support of 25 different projects in China testified to the corporate social responsiblity that HSBC has all along advocated. Now, let me briefly touch upon what we call the "new normal" in Chinese economy. The "new normal" is charaterized by the following. · Growth rate has slowed from a high to a medium-high speed. · Growth model is evolving from one of size-and-speed-first to one that emphasises quality and efficiency. · Economic structure is going through deeper adjustments. The focus is moving away from indiscriminate expansion towards fine-tuning existing capacity and optimizing added capacity. This "new normal" presents China with development opportunities of strategic importance. To seize the opportunities, China will press ahead with indepth reform in the financial system and steadily push for the internationalization of the renminbi. This will open up broader prospects for China-UK cooperation in the financial sector. This will provide better opportunities for British financial businesses in China. This will create new space for foreign banks, including the HSBC Group, to expand their operations in China. Going forward, 2015 will be an important year for China-UK relations in many aspects. It will be a year of high-level visits, to be kicked off by the first-ever China tour of the Duke of Cambridge in a few weeks time. It will be a year of general election in the UK. I hope China-UK relations will stay on an even keel. It will be a "Year of China-UK Cultural Exchange". I am sure there will be no shortage of highlights in the bilateral cultural and people-to-people exchanges. The year 2015 is also a special year for the HSBC Group. Let me extend my warmest congratulations on your 150th anniversary. May the strength of old roots give life to new branches and fragrant blossoms! May HSBC continue to grow stronger through innovation! May you play a bigger role and make greater contribution to China-UK econimc, trade and financial cooperation! In a matter of days, it will be the Year of the Sheep. Mr. Flint, this is going to be your year. May I follow the Chinese tradition and wish you good health and every success in your year of the sheep. I also wish everyone a happy and prosperous Year of the Sheep.